3 April 2019: FrieslandCampina, one of the world’s leading and largest dairy cooperatives, today launched a new national headquarters in Saudi Arabia. Following 60 years of success in the Kingdom, the new site represents further growth for FrieslandCampina in the country and the evolution of its operational structure to deliver effective, more consumer-centric services across KSA. Specifically, the new headquarters will enable FrieslandCampina to expand the reach of its product distribution network in the Kingdom, giving loyal and new consumers simpler access to its leading range of nutritious dairy products. The site launch will also see FrieslandCampina place a sharper focus on sales and marketing, to serve the Saudi market with the most desirable products from its broad product range. Since launching its range of Rainbow evaporated milk products in KSA in 1955 – which marked the arrival of one of the first multi-national brand in the Arab region, FrieslandCampina products have become much-loved in Saudi Arabia. 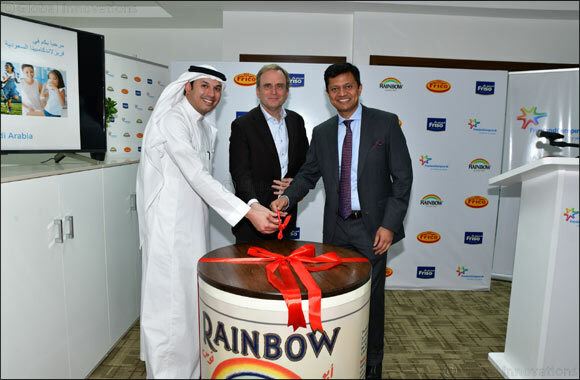 Rainbow Milk has now been a part of local consumers’ lives for generations and continues to be one of the first choice for dairy needs for its creamy, delicious taste and nutritious ingredients. Since FrieslandCampina first entered the GCC market, Saudi Arabia has played an important role in its success in the region to date. Consumers in the country have been served by products such as Rainbow Milk for over six decades, with FrieslandCampina’s products becoming a staple of household and professional kitchens across generations. Keen to continue this success, the Kingdom is fundamental to FrieslandCampina’s future growth strategy as it represents the highest consumer of dairy items among all GCC states. “Our growth in Saudi Arabia is simply a reflection of our philosophy to bring nutritious dairy products to families around the world,” commented Sumeet Mathur, Chairman of FrieslandCampina Saudi Arabia. “The Kingdom is one of our most valued regional markets, and with demand growing here, we made it a priority to step closer to the consumer, which the new office allows us to do,” added Mathur. Sami Aboukhashaba, General Manager of FrieslandCampina Saudi Arabia, added, “Saudi Arabia has always been at the core of the company’s strategy, so it is essential that we make steady progress here in order to maintain our presence. The launch of our new entity in the Kingdom is the latest example of FrieslandCampina’s progress in KSA, but also an important step in supporting the Saudi government’s Saudization efforts for the private sector. The company’s latest venture in the region reinforces FrieslandCampina’s commitment towards its loyal consumer base. The move also reaffirms FrieslandCampina’s pledge to the Saudi Food and Drug Authority (SFDA) to support the organization’s vision of greater nutritional options for KSA consumers. FrieslandCampina’s recent expansion falls in line with Saudi Arabia’s Vision 2030 plan, which strives to increase non-oil industry trading. The Netherlands-born company’s new local office also reiterates its culture of co-operation, commitment and pragmatism towards serving customers.